We are often asked about our experience of working with international associations to attract industry events to Russia, St. Petersburg, on venue presentations, and inspection visits. 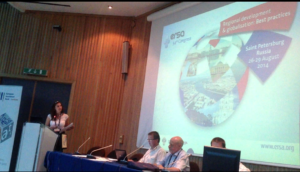 These photos and video are an example of the presentation of the European Regional Science Association Congress in 2014 (ERSA 2014 Congress) at the previous Congress in Palermo, Sicily – presentation to the European Organizing Committee (EOC) and the Association Committee (ERSAC). The attractiveness of St. Petersburg as a cultural center is not in anyone’s doubt (theaters, museums, festivals). But it is equally important to give answers to the most burning questions: getting a visa to Russia, traveling around the city, the quality of hotels and prices for accommodation, security on the streets and public transport, sponsorship (including that one from the city Government). 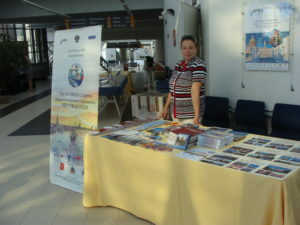 During the registration we organized our stand and presented the venue to potential future delegates. discussed the logistics and registration at the same time in several locations, work with several dozen volunteers. 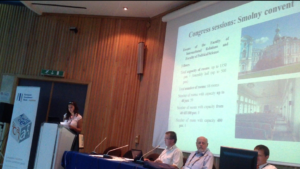 Good experience for Monomax team!